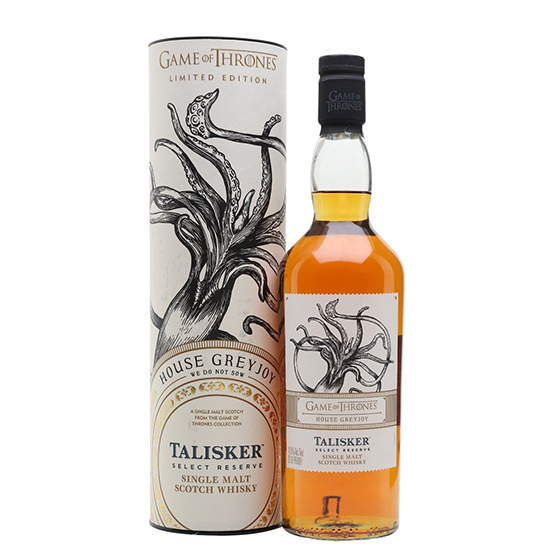 Talisker Select Reserve – House Greyjoy is a whisky created by Diageo and HBO, the Game of Thrones producer. Not much is known about this product, it is a No Age Statement whisky in the classic ABV of Talisker, 45.8%, which should be aged in heavily charred ex-Bourbon American oak barrels. Compared to other bottles of the series, this Talisker is still available and the price has not increased- A sign that availability is not exhausted. The Greyjoy house, to which the bottle is dedicated, located on the Iron Islands, whose inhabitants are expert sailors and warriors of great value. The similarity with Talisker is the difficulty in reaching the island. Nose: medium intensity, starts with notes of white pepper and salt, then hints of burned wood that flow into notes of caramel and vanilla. Honey candy, yellow apple and black pepper. Nose without great complexity. Palate: intensity just above average. Oily, black pepper and slight salinity, all on notes of ripe yellow fruit. There is peat and traces of dry wood present. Hints of coffee beans and dark chocolate with salt. Finish: medium persistency. Vanilla, yellow fruit, spicy dryness of black pepper and maritime notes of salt. Talisker Select Reserve – House Greyjoy is a young Talisker, simple and enveloping, particularly on the palate. It is certainly not the best Talisker in history. It lacks complexity and characteristics that the company has always emphasized in each of its releases.